With each seasonal transition, I’ve seen tons of posts about fitness goals, healthy eating challenges, and planners. 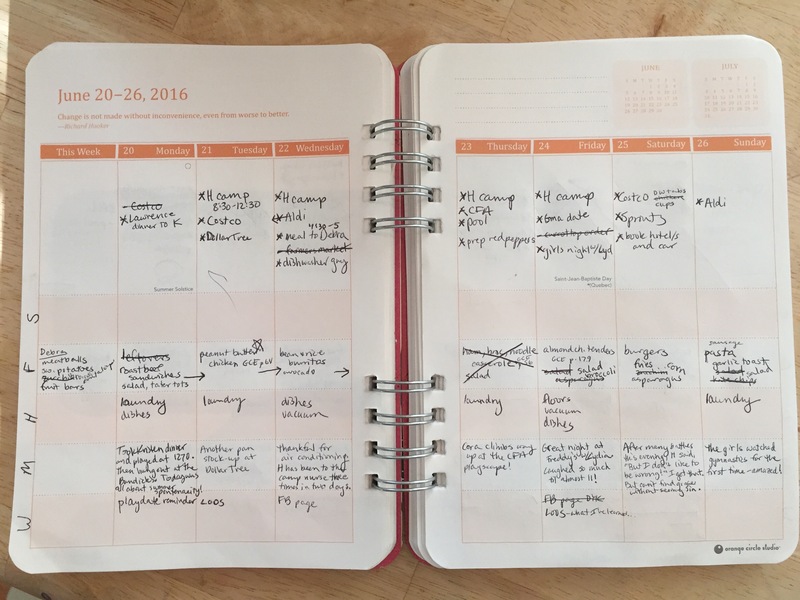 People ask for planner advice, but after years of hit-and-miss techniques I feel like there’s no straight answer. And the options are indeed overwhelming! Printables, bullet journals, Erin Condren, binders, monthly/weekly/daily, white boards, phone apps! There are a lot of factors for planner success such as age of kids, number of activities, what you want to plan. I’ll share what works for me, and maybe you can adapt it for your family. I’ve been using this particular style of planner for two years, and I like that it has the option to go by the school year instead of the calendar year. This works much better for me as I can sit down in August with Hannah’s school schedule and fill everything in. School – First grade was a whole new world of responsibilities. This helps us keep track of the days’ specials (need gym shoes? ), tests, homework due, library book due, guided reading book due, bring xyz for a science experiment, wear purple for the principal’s birthday, etc. 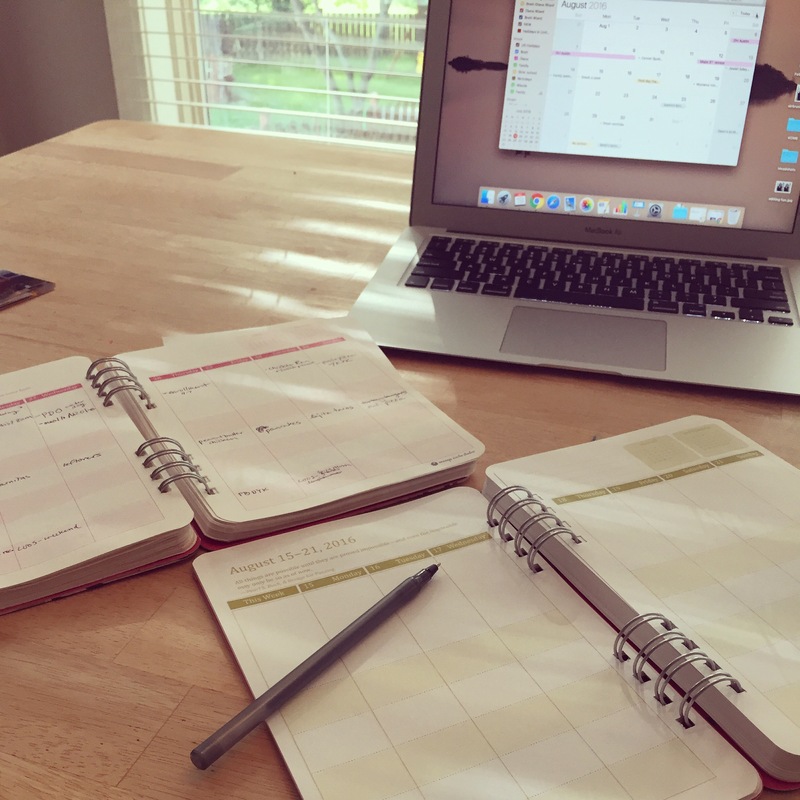 Food – Meal planning is huge for me. This helps me think ahead for smart shopping and coordinate meals with the day’s activities. For example, I’m not going to plan a slow cooker meal on a MOPS day because I won’t have time in the morning to prep it. I also star meals that are family favorites so I can remember to make them in the future. Housework – I don’t have a cleaning schedule or a to-do list. Instead I have a “did” list. Usually I shoot for one thing per day. It could just be a load of laundry. But I write down what I DID, and it’s a documentation of productivity. Memories – These are funny things the girls said or little things we did that I want to be able to look back on. It’s a very small journaling aspect. 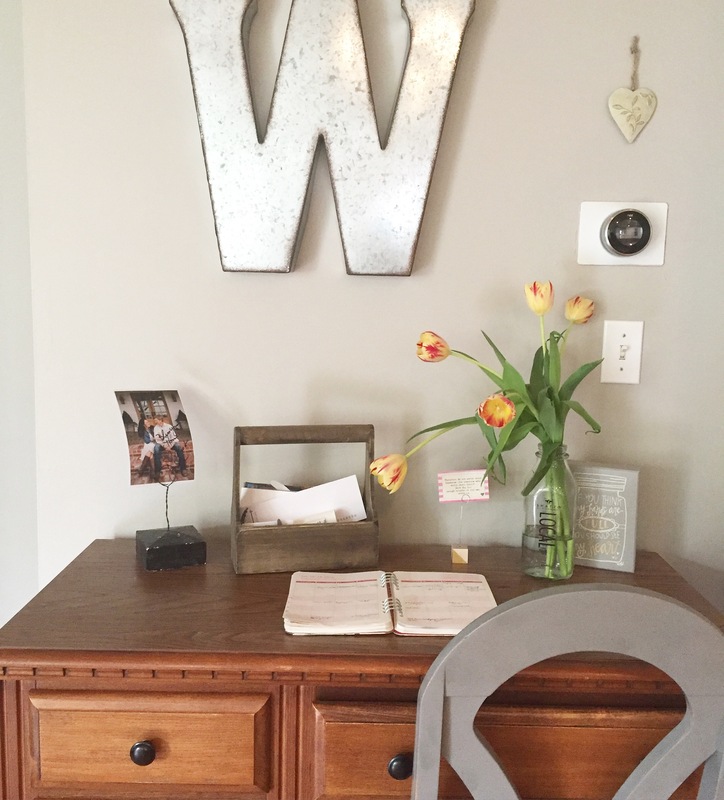 Work – I don’t have work for a “job,” but this box includes my MOPS tasks, Kansas City Moms Blog schedule, and planning for this blog. In the summer, I order the new planner and transfer anything from the previous year. (would stickers and color-coding jazz it up? yes, but I like the clean simplicity of pen and boxes) I go through the school calendar and fill in the new paper calendar as well as our Google calendar. The Google calendar keeps Brett and I on the same page and provides a mobile version of our main activities. I only include appointments and scheduled activities on the Google calendar. There are a lot of schedule/calendar apps (I’ve heard rave reviews of Cozi for bigger kids! ), so look around for what meets your needs. The third form of calendar that I use is a white board in our eating area. This is for family reference – activities and dinner plans. Now that Hannah’s a reader, this is especially useful. I keep my planner always open on my desk as part of my “mommy workstation.” It helps me keep an eye on things and easily jot down what I’m doing. Maybe this seems overwhelming: the meal planning, the planner, the online calendar, the whiteboard, etc. But I didn’t start doing all that at once. If you’re jumping into better planning, pick one and add later. I think the two most important aspects are meal planning and writing down commitments. Meal planning is huge for sanity and budget reasons. Writing down responsibilities for work or school or friends is also of great importance because we forget! Time gets away from us, and we can drop the ball and let people down if we lose track of our commitments. So it takes three things to keep us on-track with our schedule. I’m still tweaking, such as now using pencil for my planner instead of pen, but this works well for us. 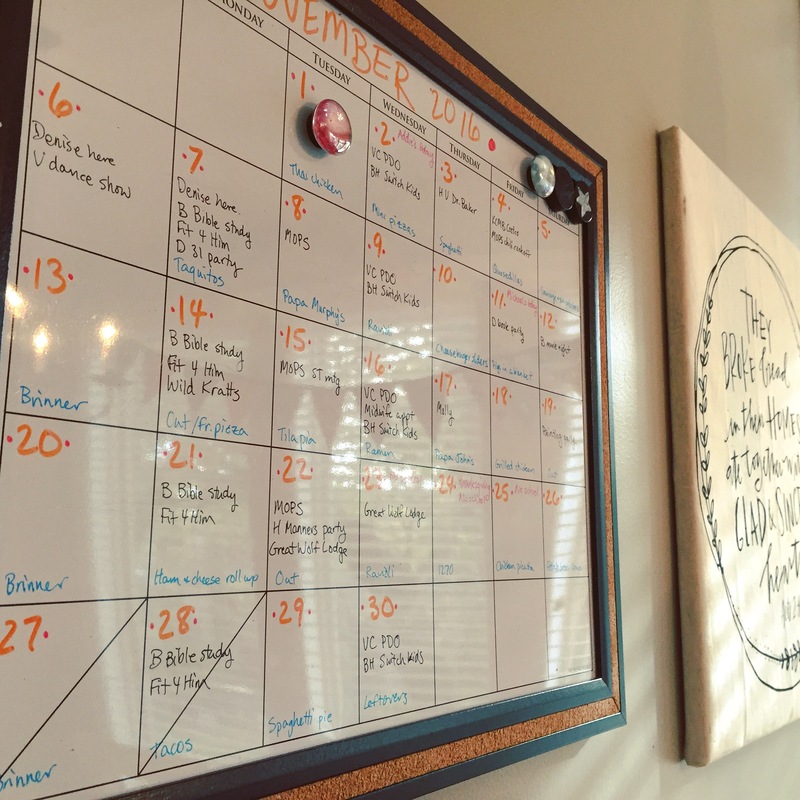 Paper planner for me, mobile calendar app for us adults, and posted white board for the family. I plan according to the school year not the calendar year, so I’ve ordered my next blank slate and can’t wait to fill in those boxes!